In 1947, Dalton Trumbo (Bryan Cranston) was Hollywood’s top movie screenwriter. Trumbo’s life was changed forever when he was jailed and blacklisted for his political beliefs. However, Trumbo refused to let fear and isolation stop him from writing. Instead, for 13 years, he used words to win two (uncredited) Academy Awards and expose the absurdity and injustice of the blacklist. Director, Jay Roach’s, Trumbo is based on the fascinating life story of an unique and fascinating man. The film takes place during a horrendous time in US political history when the House Un-American Activities Committee forced people to testify against their friends and colleagues and jailed citizens purely for their political beliefs. That a movie screenwriter such as Dalton Trumbo was locked up and then blacklisted for political views once supported by his own country seems unimaginable today. However, Trumbo brings this nightmare to life and proves an effective reminder that we must never let this happen again. Bryan Cranston gives a superb performance as Trumbo - fully deserving of his Oscar nomination (although he lost out to Leonardo DiCaprio's performance in The Revenant). His utterly convincing presence truly lifts this film. Cranston is ably supported by an impressive supporting cast including Diane Lane as Trumbo’s wife, Cleo, Elle Fanning as his eldest daughter, Nikola and Louis C.K. as poignantly humorous composite character, Arlen Hird. Halfway through the movie, we meet movie producer Frank King as played by John Goodman. Goodman is, as ever, a scene-stealing joy to watch. 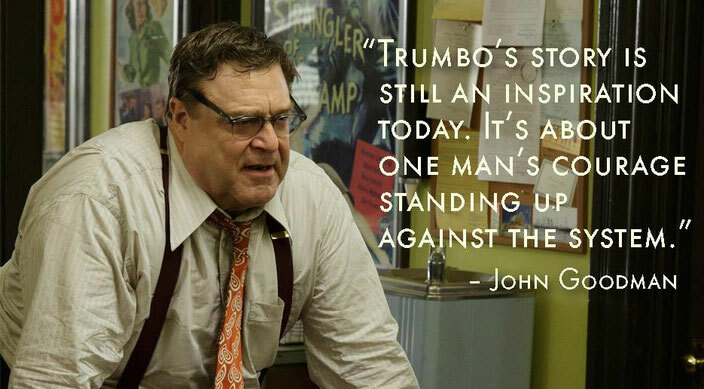 He delivers one of the most memorable speeches in Trumbo – all whilst welding a baseball bat. While an interesting and enjoyable watch featuring a superb leading performance, I did not find Trumbo particularly gripping. That is not to say that I was bored at any stage (Cranston’s performance saw to that), more that the movie felt a little pedestrian in its storytelling. In addition, despite the film’s lengthy (over two hours) running time, I found myself craving more information or clarification. However, further investigation into this time in history could never be a bad thing and I would not hesitate in recommending Trumbo. Even today, many screenplays that Trumbo wrote (or rewrote) during this dark period remain unaccredited to him. After his exoneration, Trumbo lamented that “The blacklist has done more to make my name known than any work I ever did”. At first this appears a victory. However, when you have written something as wonderful as Roman Holiday (which I recently re-watched), surely you should be remembered for your words and not your political victimisation. 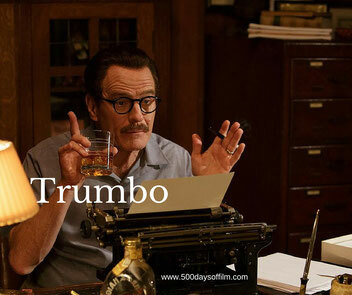 Trumbo was inspired by Bruce Cook’s book Trumbo. I haven’t read this book but, now having watched the film, I would very much like to get a copy. If so, what did you think of this movie? Let me know by leaving a comment in the box below!